Does the film give a false impression of how astonishing Maya Bay actually is in reality? Sat in my bedroom with Tony Bessant in 2012 I told him that he needed to see the famous Maya Bay scene from The Beach, directed by Danny Boyle. A huge chunk of the film was shot in Maya Bay, the pinnacle of natural beauty- a small alcove in the Andaman sea that replicates paradise. Immediately after the ‘Maya Bay’ scene whilst watching The Beach there was a telepathic understanding that we would be going to this magical place. A few months down the line we booked our flights to travel around Thailand. 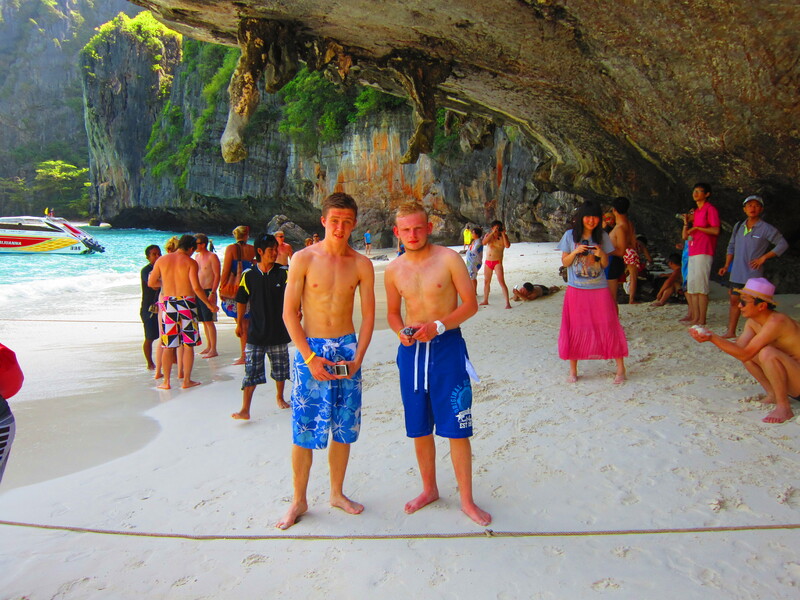 We visited many places including the Phi Phi Islands where Maya Bay is situated. Half way through our vacation in Thailand we found ourselves in the crystal clear waters of the Phi Phi Islands climbing into a small boat, the sky was blue. 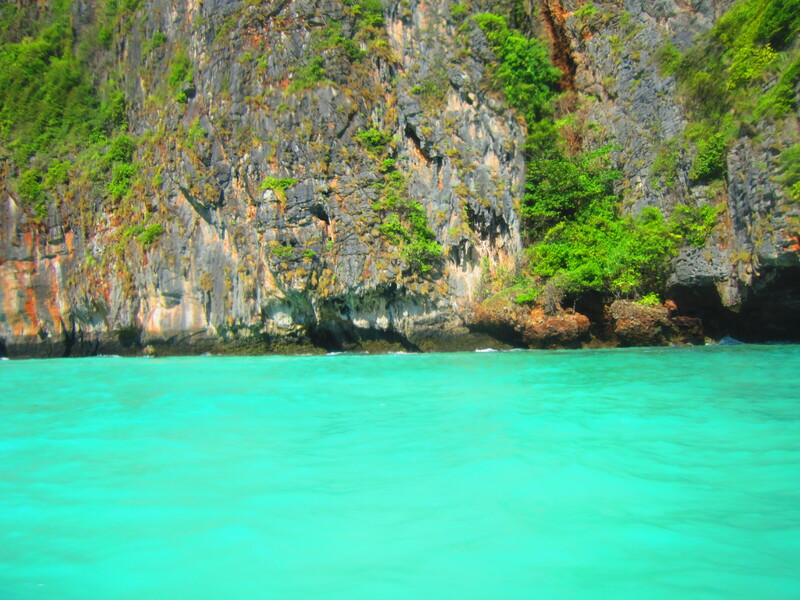 Our host would be taking us to Maya Bay- along with a few other places dotted around the Islands. After about 15 minutes of being on our boat, the natural rock formation in the distance that surrounds Maya Bay was becoming visible as we skimmed the waves of the Andaman sea. Heading towards the bay through the middle of the enclosure the water below was clear, bearing in mind we were still a couple of hundred metres from the beach, the water was deep! The boat pulled up and out we jumped out. The water near the beach was warm and the sand white! We spent our time stumbling up and down the iconic beach, where Leonardo Di Caprio once read out his lines in front of Danny Boyle and the crew. Strolling through the bush behind the beach, venturing further into the alcove myself and Tony barely spoke. We were speechless, astonished. After spending roughly half an hour on the island we headed back out of Maya Bay. On the way back we experienced cliff jumping, visited monkey beaches and snorkelled with sharks. 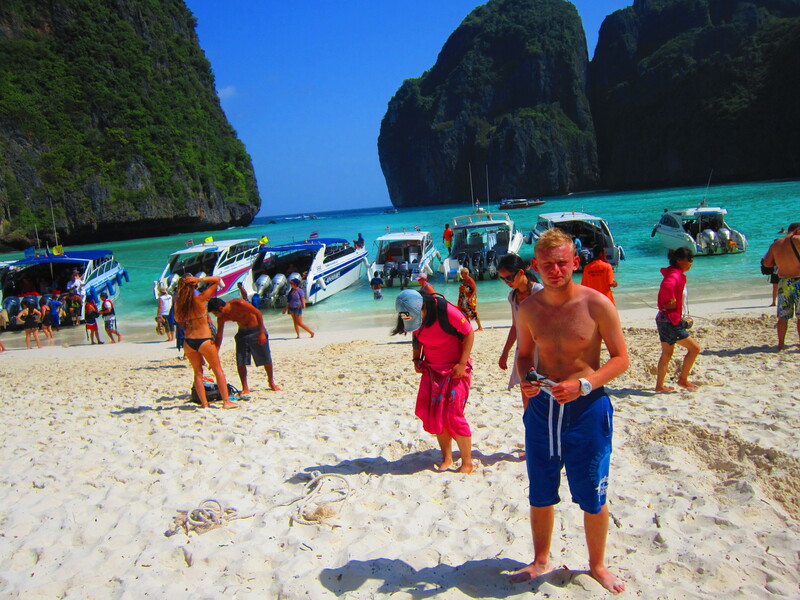 This entry was posted in Random and tagged Andaman sea, clear water, Danny Boyle, Film, film location, film set, Leonardo Di Caprio, Maya Bay, Paradise, Paul Williams, Phi Phi, Thailand, The Beach, Tony Bessant on February 22, 2014 by pauljwilliams7.